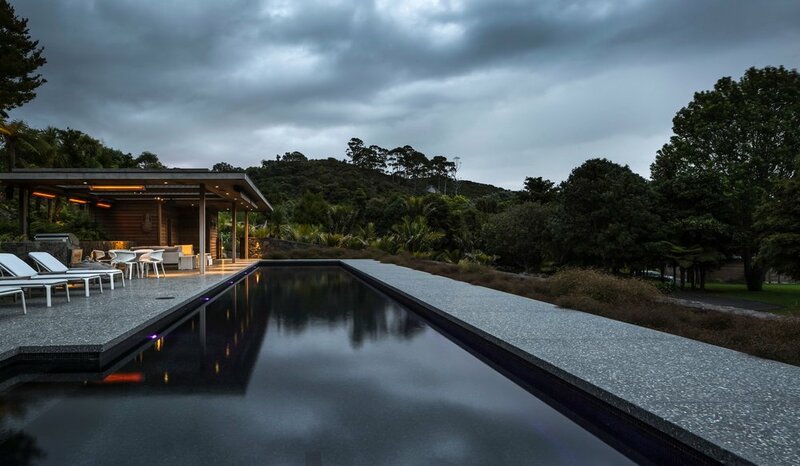 A finely crafted cedar roof hovers above a terrazzo platform, acting as a pavilion that negotiates between native bush on one side and the view of a beach on the other. Detailing and structural expression is deliberately concealed to express a fine and light aesthetic. Materiality is crafted to patina, allowing the building to visually soften over time against the surrounding bush. A services enclosure contains a kitchenette, bathroom, and mechanical plant room within a cedar box that is set back under the pavilion and against the bank. Elevated from the surrounding lawn, the pool platform is a podium positioned for view, anchored back to the hill and demarcated from the lawn with a stone wall. A stone wall, typical of the area, provides a pool fence from the outside while containing established planting on the inside. Planting, pool and platform are brought together in volume so as to enhance the view and spatial parameters.